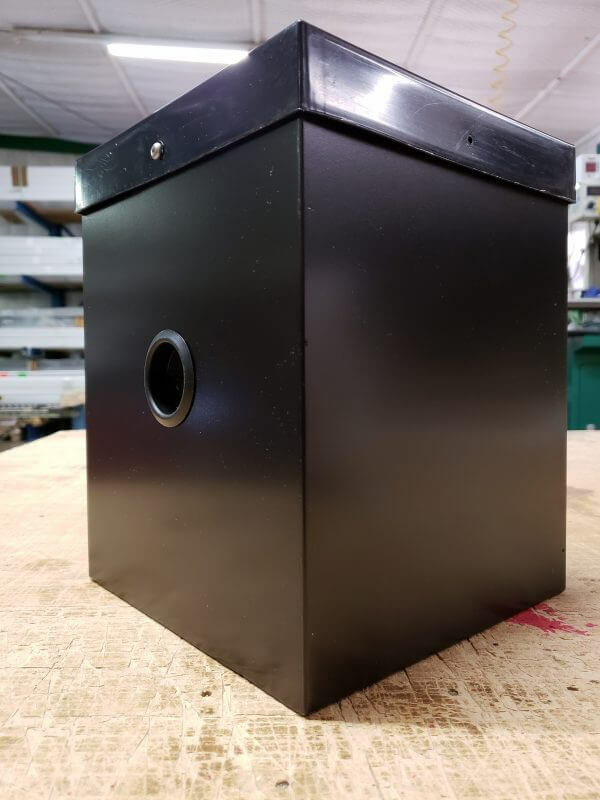 With our 8×10 Bolt-On Mounting Platform (Bird House), using large hose clamps to secure heavy or bulky security cameras, cabinets, and devices to the poles is a thing of the past. We designed the Birdhouse to be heavy duty; it is made out of 3/16″ aluminum, with four long and wide mounting faces, and the overall dimensions 8″ x 8″ x 10″. With three of the mounting faces, we pre-drilled 1″ electrical knockout holes for wiring access (actual hole size is 1.362″) and will accommodate any type of 1″ conduit fitting, wire gland or liquidtite fittings. These holes come sealed with weatherproof rubber hole plugs that can be cut to allow wiring to pass through, or can be removed quickly if you are installing a gland or fitting. The fourth face does not have a pre-drilled knockout hole because this face is commonly used to mount large power supply boxes or equipment cabinets. However, the aluminum can be drilled quickly to accommodate any size access holes you may need. For cabinet mounting, stainless self-driller screws can be used, or you can also pre-drill bolt holes if needed. Our 8″x10″ mounting platform is designed to bolt-on top of the 4″ Square Pole series and our SteadyMax Pole line. The pyramid cap is held in place with stainless steel screws that can be removed to install the platform on the top of the pole and easy access for connecting the wiring for your devices. This bolt-on 8×10 mounting platform can be used by itself on the pole top, or it can also be combined with other bolt-on accessories to provide a complete security mounting solution. Call a Strong Poles Sales Engineers toll-free 844-669-3537 or stop by our website for more mounting options. This entry was posted in Blog, Camera Mounting Options, Security Camera Mount and tagged Bird House, camera mount, Mounting Platform.